The Authentication tab allows for the configuration of network authentication methods. To enable an option, click the empty checkbox beside it. To disable an option, click the checkbox beside it to clear the checkbox. Realm — Configures the realm for the Kerberos server. The realm is the network that uses Kerberos, composed of one or more KDCs and a potentially large number of clients. KDC — Defines the Key Distribution Center (KDC), which is the server that issues Kerberos tickets. Admin Servers — Specifies the administration server(s) running kadmind. The Kerberos Settings dialogue also allows you to use DNS to resolve hosts to realms and locate KDCs for realms. 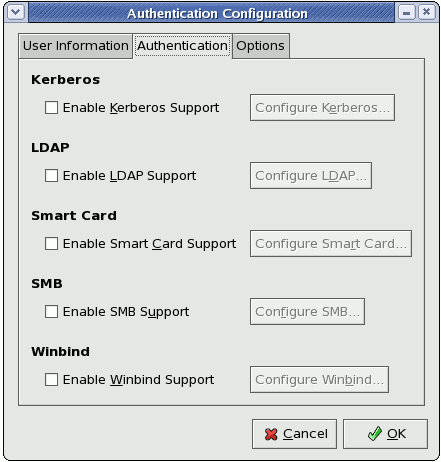 The krb5-libs and krb5-workstation packages must be installed for this option to work. For more information about Kerberos, refer to Section 48.6, “Kerberos”. The Enable LDAP Support option instructs standard PAM-enabled applications to use LDAP for authentication. The Configure LDAP... button allows you to configure LDAP support with options identical to those present in Configure LDAP... under the User Information tab. For more information about these options, refer to Section 29.1, “User Information”. The openldap-clients package must be installed for this option to work. The Enable Smart Card Support option enables Smart Card authentication. This allows users to log in using a certificate and key associated stored on a smart card. Click the Configure Smart Card... button for more options. The pam_pkcs11 and coolkey packages must be installed for this option to work. For more information about smart cards, refer to Section 48.3.1.3, “Supported Smart Cards” under Section 48.3, “Single Sign-on (SSO)”. Workgroup — Specifies the SMB workgroup to use. Domain Controllers — Specifies the SMB domain controllers to use. The Enable Winbind Support option configures the system to connect to a Windows Active Directory or a Windows domain controller. User information from the specified directory or domain controller can then be accessed, and server authentication options can be configured. The Configure Winbind... options are identical to those in the Configure Winbind... button on the User Information tab. Please refer to Winbind (under Section 29.1, “User Information”) for more information.